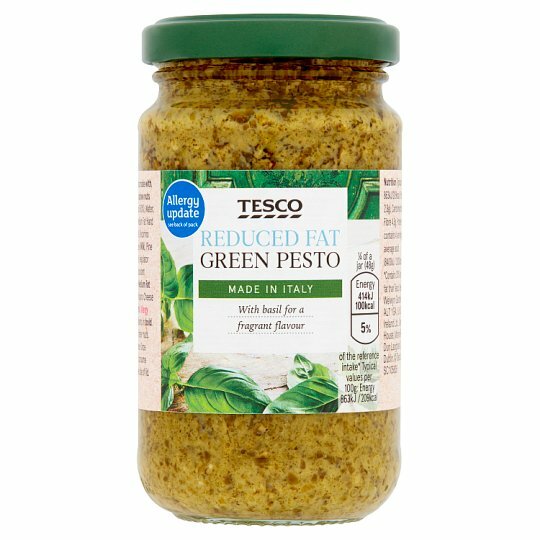 Reduced fat Italian green pesto made with basil, Grana Padano cheese, cashew nuts and pine nuts. Basil (50%), Water, Sunflower Oil, Grana Padano Medium Fat Hard Cheese (2.5%), Cashew Nut (2%), Pecorino Romano Medium Fat Hard Cheese (Milk), Pine Nuts (1%), Salt, Rice Flour, Acidity Regulator (Lactic Acid), Garlic Powder, Antioxidant (Ascorbic Acid). Store in a cool, dry place., Once opened, keep refrigerated and consume within 2 weeks.